All photos in this post are taken under artificial light. All are topped with Glisten & Glow HK Girl topcoat. Matte swatches are topped with Glisten & Glow matte topcoat. This polish was provided for my honest review. 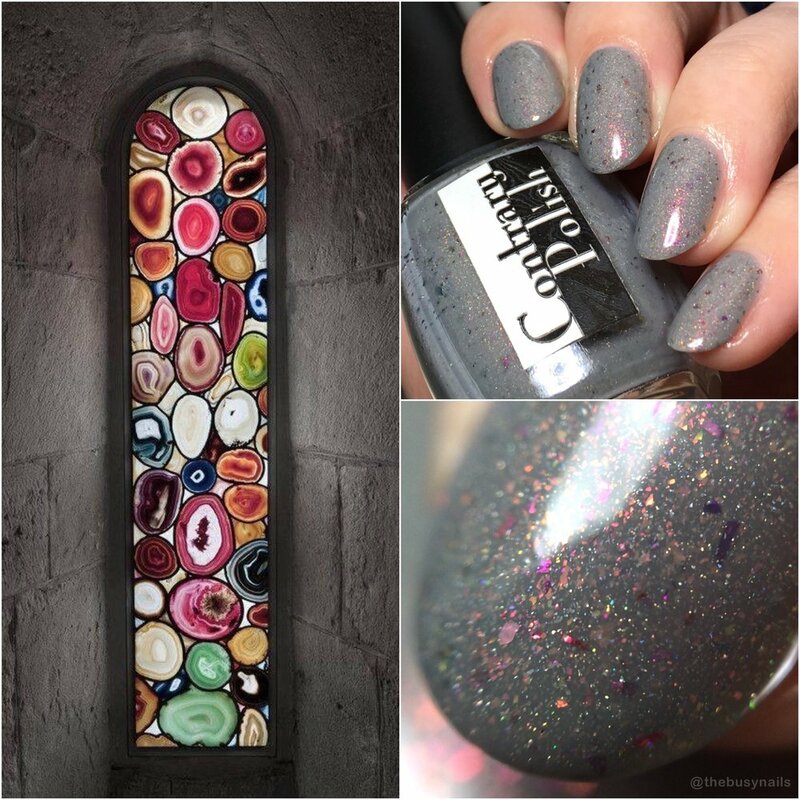 The inspiration behind this stunning polish is this amazing stained glass agate window. Some words from the maker: Since I’ve put out similarly themed collections in the past, I decided to go a little outside the box for the “Crystals & Gemstones” Polish Pickup. I chose this beautiful stained glass window from the Grossmünster church in Zurich as my inspiration. The artist Sigmar Polke created this and six other windows using thinly sliced agate, and the effect of the light shining through the agate slices is just amazing. Maker description: A grey polish with multichrome shimmer/flakes (shifting from pink to orange to green) and scattered holographic sparkle. The shimmer in this polish is similar to the infamous “unicorn pee” and is gorgeous in all light - so glowy! Formula: Good formula. I haven't used many polished from Contrary, so I was pleased to find that this had a nice, smooth, easy-to-use formula that covered easily in two coats. My thoughts: You all know by now how I feel about greys, (deeply, madly in love), so it should be no surprise that I love this polish. The shimmer is the star of the show. It really gives the polish an overall glow. Although this is loaded with shimmer, holo and flakes, the grey base makes it really wearable for most occasions. Win win! 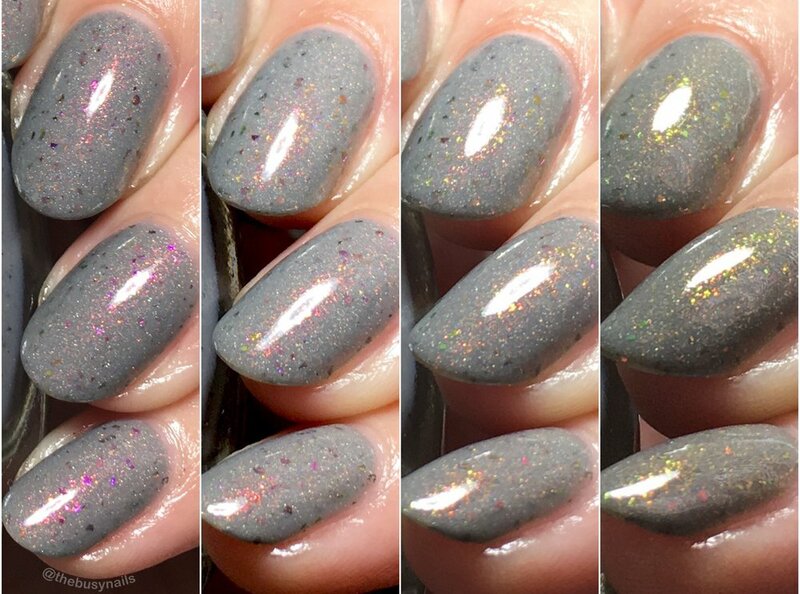 This collage shows off the beautiful shifts in the shimmer. Overall it has a really pretty glowing effect and shifts easily. These next photos show the polish with matte topcoat. 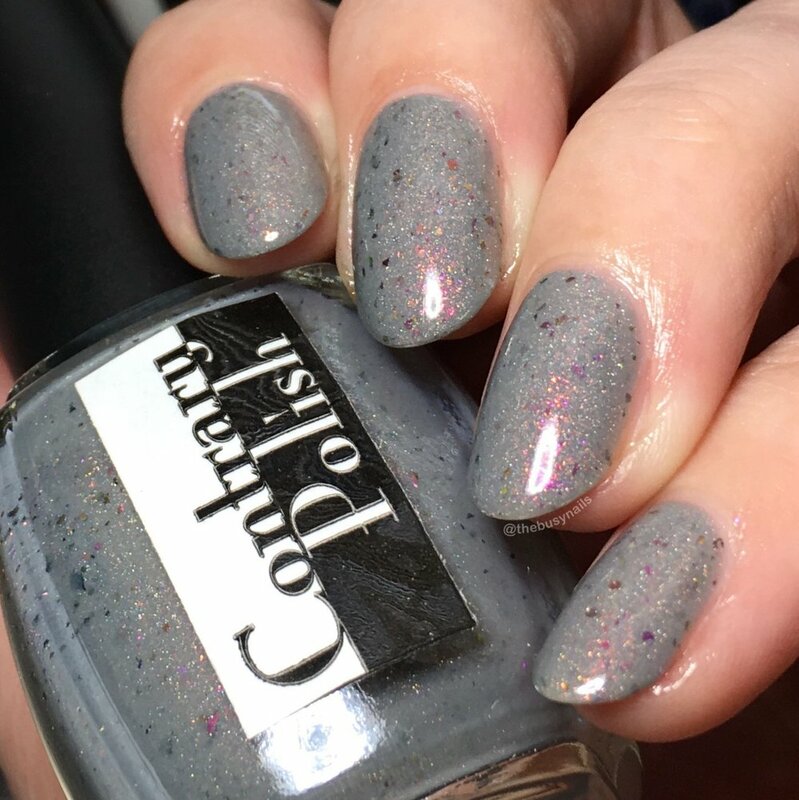 You can purchase Contrary Polish "Any Way You Slice It" on the Polish Pickup website Jan. 5th at 11 AM EST thru Jan. 8th at midnight EST for $12. There is no cap.